Ferrite beads and chokes both have impedance characteristics that can be employed as filters and safeguards to muffle unwanted interference in electronic circuits. Random high frequency signals, also know as “noise”, can cause other nearby circuits to fail to operate correctly. An analogy for unwanted noise on top of the signal is being at a party and trying to have an intimate conversation with someone you can’t hear because everyone else around you is being too loud. In circuits, through electromagnetic coupling, a circuit that has extremely sharp pulses can induce extra signals over and above the main signal in a nearby circuit and thus becomes a source of noise, which makes it almost impossible for the receiving circuit to interpret the main signal. So, what exactly are these things? A ferrite bead or choke is a non-resistant electronic member composed of ferromagnetic compounds that contain iron and trace amounts of nickel, zinc, or manganese oxides. The impedance properties of the ferrite choke allow it to act with a high resistance to high frequency signals and low resistance to lower frequency signals. This way, the high frequency noise is damped out and the absorbed energy is converted to a very small amount of heat. The type of ferrite material used in the bead will determine the range of frequency suppression, and the physical dimensions and shape of the ferrite bead determine the amount of suppression possible. The beads themselves can be nothing more than a dowel-type device that has a hole in the center or something that looks like a metal blob, which is really a multi-layer bead utilized in surface mount applications. 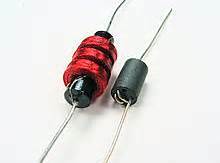 Electromagnetic Interference (EMI) suppression beads, which are comparable to inductors, are designed to rise in the transmission of signals with frequency until a resonance point. While a regular inductor\’s wave propagation would begin to drop as frequency continued to increase, the ferrite bead inductance flattens out and acts as a perfect muffler for a wide frequency band. One extremely basic use of ferrite chokes is on computer cables. You\’ve probably seen these before; they look like a bump or a cylinder in the cable. These cylinders are snap-on ferrite beads that suppress the potential RF interference from the cables. They can also be used in cell phones. There is no agreement on whether the radiation that emanates from cell phones will result in damage to one\’s brain, and there are various devices being offered for sale like ferrite chokes or shields that are crafted with the intention of suppressing the radiation and the interference from the phone. If your cell phone is located anywhere near the speakers of your PC, you will actually hear this interaction of sound waves or interference. Usually what happens is that you hear an irritating buzzing, which occurs because the cables on those speakers pick up the energy transmitted from your cell phone. Besides adding beads to your own telephone, you might also want to put snap-on-beads on your speakers to muffle the interference (unless you want the two second alarm that your phone is about to ring). Because today\’s circuits are faster and more of them are packed onto a circuit board, it is extremely desirable to employ ferrite beads and other techniques to suppress noise. Digital designers only think in terms of ones and zeros signaling until they uncover the nightmare of the sphere of analog where there is noisy circuit conduct or interference from power supplies or problems with grounding. Besides protecting yourself from your own circuits, there are numerous ‘harden applications’ where you need to protect the circuits and muffle any noise caused by external sources. An example would be a strong transmitter such as a cell phone accidentally being operated on a plane or a more purposeful attempt to jam a military application. Ferrite bead and chokes are basic devices that can serve as the first line of defense for RF muffling and other noise suppressing uses. A company that produces beads can give you the arcs of impedance vs. the frequency for the beads they manufacture; typically their application engineers can assist you in choosing the correct type of bead. Cameron Tacassi works extensively with electronics, adding ferrite chokes and Pulse transformers to speed the functioning of electronic equipment. While not from an inductor manufacturer, Cameron still knows just about everything about custom magnetics and chip inductors, as well as quite a bit about power transformers and, his personal favorite, the RF transformer.